Peanut butter muffins with a tasty surprise inside - jelly! This is one treat that any peanut butter and jelly sandwich lover is sure to appreciate. 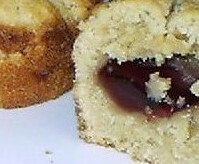 These muffins are easy to make, just be sure to cool them completely because the jelly in the center gets very hot. Serve as a breakfast or brunch muffin, for a snack, or pop in your child's lunch box. Line a muffin pan with 12 paper muffin liners. In a large bowl, combine flour, sugar, baking powder, and the salt; set aside. In a separate bowl, mix the peanut butter with the egg. Add the milk. Works best if you add a little at a time. Add the butter; mix well. Pour the wet batter into the dry flour mixture; stir well but gently. The batter will be stiff. Fill each muffin liner with a heaping tablespoon of batter. Use the back of a spoon to put an indentation in the center of each muffin and then add a teaspoon of jelly into the center of each indentation. Cover the jelly with another heaping tablespoon of batter. Each muffin cup should be about 2/3 full. Spread the top of the batter on each muffin until no jelly is visible. Bake the muffins for 17-20 minutes. Remove from the oven and cool for a few minutes before removing and transferring the muffins to a cooling / baking rack. Completely cool the muffins before serving. The jelly centers can get very hot. It couldn�t be easier to dress up a cupcake or treats! Fill with candy or nuts or use for mini muffins. Mini size 1-1/4 diameter cups. Many children are allergic to peanut butter. Peanut butter can cause reactions, such as anaphylactic shock. Because of this, several schools have even banned peanut butter. So please, check with you child's school to make sure they haven't banned peanut butter before you stick these peanut butter and jelly muffins into your child's lunch box. If the school has not banned peanut butter foods, you should still instruct your child not to share their muffins with other kid's at school, just in case the person they share with has an allergic reaction. Share You Recipes On Wizzley! My husband would love these muffins! We'll definitely try them. Freshly baked cookies have many advantages, from control of the contents, tweak the flavor to your liking, and that wonderful aroma. And can be stored in beautiful cookie jars.